30/04/2016 by Allan Burgess 1 comment on "Olympus Mju II – Ultra Compact 35mm autofocus film camera"
Some 3.8 million copies of the Olympus Mju II were sold. It was called Stylus Epic in the US market. It is an iconic example of design and function coming as it did near the end of the 35mm film era, just before the arrival digital cameras and mobile phones with inbuilt digital cameras. Olympus also made another relatively inexpensive and immensely popular 35 mm zone focus camera in the two preceding decades before the Mju II called the Olympus Trip 35. Olympus Mju II. The lens is shown in the taking position. Since the arrival of these miniature digital marvels secondhand stores or junk shops have been awash with excellent little 35mm cameras. You can easily get them today in New Zealand for a dollar each – often in perfect condition. I find it amusing that this camera, and other Mju models, occasionally sell on the New Zealand auction website Trademe.co.nz for up to several hundred dollars. This particular model has a cult following of sorts the world over. Although millions of them were made, it might even be a good idea to start hoarding them as the price can only go up! The Olympus Mju II was originally sold with a little soft velvet cloth bag. Film and developing were and still are expensive. Most people didn’t carry around their film cameras taking casual shots of everything the way we do today with mobile phones. Many occasional photographers would keep their 35mm cameras safely in a drawer when not to use. Therefore you often find them in junk stores in near mint condition. Size comparison between Olympus Mju II, Ricoh 500G, and Minolta 7S. The stand-out feature of the Olympus Mju II is its very small size. The height of the camera isn’t much more than that of a 35 MM role of film. That was one of the main reasons I carried it in my fly fishing vest; it isn’t bulky, takes up little space, weighs just 135g (without the battery), and takes great shots. The Olympus Mju II is only slightly taller than a 35mm film cartridge. It is autofocus and auto exposure, so not much thinking is required to use it. Film speed is set by the camera when using DX-coded film. So the little Olympus Mju II is ideal to keep in your pocket when fishing. You can quickly get it out of your pocket, slide back the lens cover, aim through the viewfinder, and take a couple of photographs before releasing your fish back into the water, slide back the lens cover and return it to your pocket within seconds. This is way quicker than using a mobile phone where numerous screens have to be tapped to get to the required camera function, all of which are difficult to see in bright sunlight. A well scanned negative will also hold its own quality-wise compared with a digital point-and-shoot, though the whole process will be much slower and more expensive as the film will have to be developed. There are several drawbacks with this camera if you look for them hard enough. Firstly, it uses the expensive 123 size 3-volt lithium batteries which cost about NZ$15.00 each. Without a battery, this camera is completely useless and cannot be used at all. It is, therefore, essential to always have a spare battery on hand. I have found the battery can go flat suddenly without warning particularly after a film has just been rewound. You can’t always rely on the LCD battery panel indicator. According to the instruction book, Olympus says you should be able to shoot about 20 roles of 24 exposure 35mm film with a new fully charged battery. If you don’t use the flash very often you should get a lot more. Bear in mind this camera uses the battery for virtually every operation including loading film, focusing, advancing the film after each shot, and rewinding the film automatically at the end of each roll. Secondly, it has the somewhat annoying feature when the lens cover is slid back to switch the camera on, the flash will always fire unless it is turned off by pressing the flash button on the back twice before exposing the first shot! In other words, the flash is switched on by default when you turn on the camera. With the shutter button pressed just a little, there are two lights made visible inside the viewfinder. The orange light coming on tells you the flash will be used, and the green light confirms autofocus lock. With experience using the Olympus Mju II, you will likely remember this, eventually. Olympus Mju II back showing small size of LCD screen. With the shutter pressed half way the green auto focus light comes on. By still holding the shutter button half way down you can reframe the shot. Oddly, the lens doesn’t actually refocus to the earlier set mark until you press the shutter all the way down. Unlike my digital Nikon SLR which immediately focuses the lens when the shutter is pressed half way. Thirdly, you have absolutely no control of the shutter speed or aperture combination chosen by the camera’s program. For the most part, this isn’t really a problem provided there is sufficient light and you’re using a reasonably fast film. Finally, there are six exposure modes: Auto Flash, Redeye Reducing Flash, Flash-off, Fill-in Flash, Night Scene Flash, and Red-eye Reducing Night Scene Flash. These are set by pressing the two buttons on the back. However, sometimes frustratingly, these modes are all cancelled, and the Olympus Mju II returns to Auto Flash, every time the camera is switched off by closing the clam shell lens cover. There is no way of saving the last exposure mode used. As mentioned above, the default mode when switched back on means the shutter is going to fire unless you turn it off first. Annoying if you prefer natural light and mostly don’t use flash. Fill-flash mode works well on a bright sunny day to brighten the shadows for a greatly improved exposure. The little Olympus Mju II even has Spot Metering which is switched on by holding one of the buttons on the back, down and at the same time pressing and the other one. The Spot Meter works with red-eye reduction, no flash, and fill flash. This is a pretty good feature to have. I suspect that many people have used this camera without realising just how many features it actually does have. These features aren’t very intuitive. Instead, it relies on very small icons, on the equally small LCD panel, to let the user know which functions are in operation. There is a small remote shutter release available but I have never seen one. There is also a Date model called the QD. I wouldn’t want one of those as I don’t like dates stamped on my photographs. In 1998 Olympus released a limited edition of 65,000 copies of the Mju II to mark 10 million total sales of Mju/Stylus Epic cameras. This model came out in red burgundy with gold coloured lettering and trim. Type: Full automatic 35 mm autofocus lens-shutter camera. Film format: 35 MM standard DX-coded film. Lens: 35mm f/2.8. it focuses from 0.35m to infinity. The lens is physically very small being just 14mm across the front element. It features 4 elements arranged in 4 groups. Viewfinder: Real image viewfinder (with water autofocus mark, close-up correction marks, water autofocus indicator and flash indicator). Focusing: Active-type multi-beam autofocus system. Includes focus lock. Focusing range: 0.35 m to infinity. Exposure control: programmed automatic exposure control, two-zone light metering, switchable to spot metering. Auto exposure range: EV 1.0 to EV 17. (4 seconds at F2.8 – 1/1000 of a second at F11). Exposure counter: Progressive type with automatic reset, displayed on the LCD panel. Self-timer: Electronic 12 second delay. Remote control: there is an optional infrared remote control unit with a 3-second delay. Film speed range: Automatic setting with a DX-coded film with ISO 50, 100, 200, 400, 800, 1600, and 3200. For a non DX-coded film, and film with less than ISO 50, film speed is set to ISO 100. Film Advance: Film advance and rewind are automatic. The film can also be rewound mid-roll by pressing a button on the back of the camera. This button is in a hole to prevent accidental operation and must be pressed with the point of a pen of something similar. Flash: Flash is built in. It’s working range is 0.35 to 4.1 m with ISO 100 negative film, and 0.35 to 8.2 m with ISO 400 negative film. Flash modes: Auto (automatic flash the activation in low light, backlight and fluorescent, or other artificial lighting). Red-eye Reducing (otherwise the same as auto), Flash-off (no flash), Fill-in (forced the activation), Night Scene (for night scenes with slowest shutter speed of 4 seconds, other functions operate the same as Auto), Red-eye Reducing Night Scene (otherwise the same as in Night Scene). 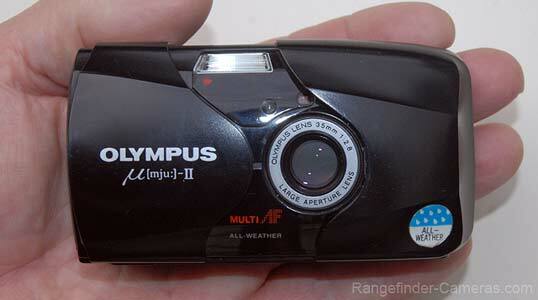 The Olympus mju II is weather-proof. Can survive a bit of water splashed on it. But isn’t water-proof. Dimensions: 108mm wide, 59mm high, and 37 mm deep. 1 Comment on "Olympus Mju II – Ultra Compact 35mm autofocus film camera"